United States President Donald Trump says he is committed to working with the Government of Liberia to advance our common agenda and deepen the strong and abiding friendship between our two countries. The American President statement was made after H.E. George Patten, Liberia’s Ambassador Extraordinary and Plenipotentiary to the United States presented his letters of credence. The ceremony took place in the Oval Office of the White House in Washington, D.C. on Friday, January 11, 2019. 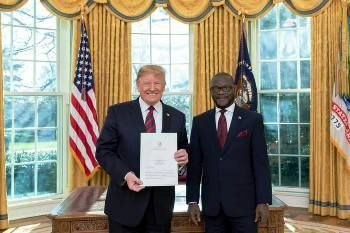 President Trump accepted the letter of accreditation from President Weah “with great pleasure” and extolled the special relationship that exists between Liberia and the United States of America, which he says is “stronger now than ever”. The American leader recalled that the “special bond” dates as far back as the foundation of the Republic of Liberia. “Since the end of the Liberian Civil war in 2003”, he said, “the country has improved security for its people and taken a difficult task of rebuilding its economy “. Ambassador Patten, a seasoned Liberian diplomat, was recently commissioned by President George Weah to represent the country in Washington, DC. He previously served in various diplomatic missions, including Ambassador to Ethiopia, Kenya, Sudan, Uganda, the African Union and Charge D’Affaires, A.I at the United Nations.